Ouch! 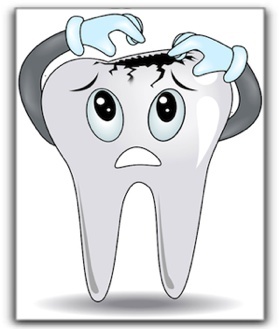 No Salt Lake City dental patient wants the pain and inconvenience of a cracked tooth, so today in the Murray Dental Blog we are going to focus on how to avoid this preventable problem. The first thing to remember is that avoiding a cracked tooth is not rocket science; you should steer clear of chewing on hard things if you don’t want a cracked tooth! This includes ice, hard candy, and (sorry Sandy cinephiles) popcorn. Also, protect against any impact to the mouth that could be experienced during sporting events. If you are a member of a local Murray UT or Salt Lake City rec center basketball, ultimate frisbee, or flag football league, pick up a mouth guard at a Salt Lake City area sporting goods store. Tooth grinding is never a good thing, and it can even lead to a cracked tooth or TMJ conditions. So, talk to your dentist, doctor, or physical therapist and try some stress reduction techniques to keep your jaw nice and relaxed. Be sure to keep your regular check-ups with your Sandy dentist because your dentist can spot possible problems that could predispose you to a cracked tooth such as an uneven chewing surface or brittle teeth. If you have a cracked tooth, you’ll want to pursue the correct course of treatment and, if needed, explore some cosmetic dentistry procedures to fix any visible damage such as veneers, a porcelain crown, or a dental implant. If you are in the Murray UT, Salt Lake City, or Sandy area and are in need of dental care or have questions about teeth whitening or smile makeovers please give us a call at 801-938-8855. Award winning Salt Lake City dentist Dr. Clint Blackwood provides cosmetic dentistry, sedation dentistry, dental implants, dentures, wisdom teeth extraction and general dentistry in Murray, Utah and serves the greater SLC area including Taylorsville, Draper, Fort Union, Sandy, Sugarhouse, Millcreek, West Valley, Cottonwood Heights, West Jordan, Riverton, Midvale, South Jordan, and Holladay. © 2012 Salt Lake Dental Care. All Rights Reserved.